The course of British, European and world history was changed here at Culloden on 16 April 1746. It was here that the Jacobite army fought to reclaim the throne of Britain from the Hanoverians for a Stuart king. The British army was equally determined to stop this happening. The ferocious European war had come to Scotland - dividing families and setting clan against clan. <p> Admission prices: Adult - £11.00, Single Adult Family - £22.00, Family - £26.00. <br> If you are visiting more historic Scotland sites, purchase a multi-day Explorer Pass to get in to 78 historic sites in the country, as it is much cheaper than buying tickets individually. Members of Historic Scotland get free entry for a year & 20% discount in the shops. Two adults and up to six children membership is £84.55. Individual fees are cheaper. <br> Hours of operation are: February 1st - March 31st daily 10:00 am - 4:00 pm (16:00). April 1st - May 31st daily 9:00 am - 5:30 pm (17:30), June 1st - August 31st daily 9:00 am - 6:00 pm (18:00), September 1st - October 31st daily 9:00 am - 5:30 pm (17:30), November 1st - December 31st daily 10:00 am - 4:00 pm (16:00), Closed 24 Dec - 1 Feb, Battlefield open daily, all year. <br> Plenty of parking for a fee.<p> The machine is located at the entrance to the gift shop. You do not have to pay the admission price to go to the gift shop. Designs all have 'Culloden' on them:<br> 1. (V) A Jacobite warrior with 'Cùil Lodair'.<br> 2. (H) A Scottish Highland cow with 'Scotland'.<br> 3. (H) The Culloden memorial cairn with 'Cùil Lodair'.<br> 4. (H) Scottish symbol (Jacobite star?) with 'Cùil Lodair'.<br> (Cùil Lodair is Scottish Gaelic for Culloden. )<p> G.P.S. 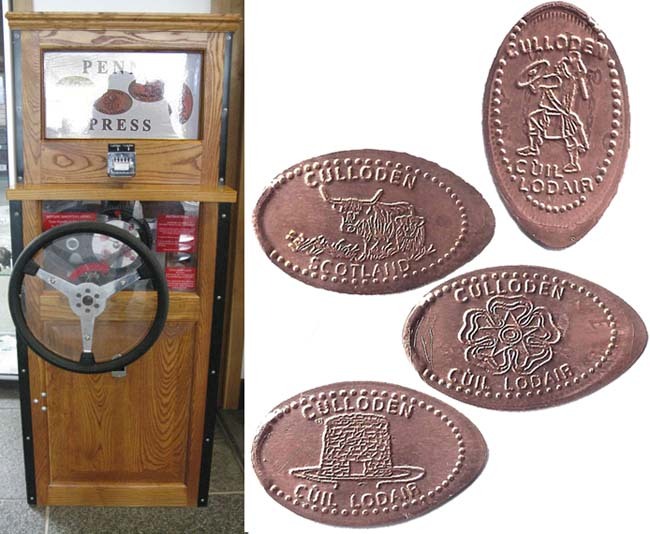 coordinates: Latitude 57° 28' 37.4988" Longitude: -4° 5' 32.1936"<p> 6/24/18: The penny machine is located by the hep desk to the left. The course of British, European and world history was changed here at Culloden on 16 April 1746. It was here that the Jacobite army fought to reclaim the throne of Britain from the Hanoverians for a Stuart king. The British army was equally determined to stop this happening. The ferocious European war had come to Scotland - dividing families and setting clan against clan. Admission prices: Adult - £11.00, Single Adult Family - £22.00, Family - £26.00. If you are visiting more historic Scotland sites, purchase a multi-day Explorer Pass to get in to 78 historic sites in the country, as it is much cheaper than buying tickets individually. Members of Historic Scotland get free entry for a year & 20% discount in the shops. Two adults and up to six children membership is £84.55. Individual fees are cheaper. Hours of operation are: February 1st - March 31st daily 10:00 am - 4:00 pm (16:00). April 1st - May 31st daily 9:00 am - 5:30 pm (17:30), June 1st - August 31st daily 9:00 am - 6:00 pm (18:00), September 1st - October 31st daily 9:00 am - 5:30 pm (17:30), November 1st - December 31st daily 10:00 am - 4:00 pm (16:00), Closed 24 Dec - 1 Feb, Battlefield open daily, all year. Plenty of parking for a fee. 1. (V) A Jacobite warrior with 'Cùil Lodair'. 2. (H) A Scottish Highland cow with 'Scotland'. 3. (H) The Culloden memorial cairn with 'Cùil Lodair'. 4. (H) Scottish symbol (Jacobite star?) with 'Cùil Lodair'. G.P.S. coordinates: Latitude 57° 28' 37.4988" Longitude: -4° 5' 32.1936"
6/24/18: The penny machine is located by the hep desk to the left.